We have finally made it to Friday. It was touch and go there for a while; but we are here. Whew. And just when I thought I was home-free for the weekend; the ugly monster stuck it’s ugly head out again. That monster is Self Doubt and Fear. I can’t let myself go there again; it is torture and makes my hours long and worrisome. Being that blogs are oh-so public, I will say no more about the point of stress; but instead harp on my goal to only focus on the happiness and joy that comes in my days. Goodness, there is so much happiness and joy! Thank you God for that; You are the one and only giver of this love. I am forever grateful. 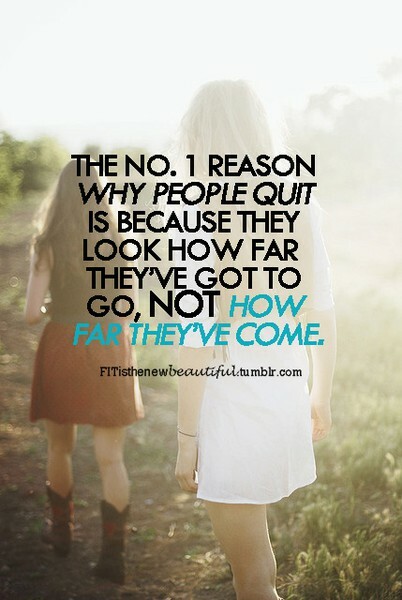 As the fun pinterest picture above says, I must remind myself how far I have come. I have come quite far. And there is more for me! I know it. I can totally keep going. So, focus I will, on my Hopes & Dreams. All other will be handled.